Reinhardt University alumni continue to excel in their careers, and a 2006 Price School of Education graduate has been honored by the state for her work as an educator. Rachel Wasserman ‘06 was surprised May 23 with the announcement that she was named the Georgia 2016 National Distinguished Assistant Principal. Woodstock Elementary School Assistant Principal and 2006 Reinhardt Alumna Rachel Wasserman was surprised May 23 as she was named the Georgia 2016 National Distinguished Assistant Principal. 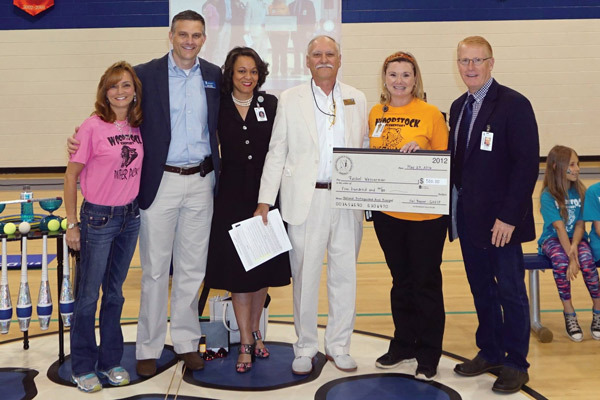 She is pictured (second from right) with Woodstock Principal Kim Montalbano, Trey Olson (CCSD deputy superintendent), Dr. Nicole Holmes (CCSD school operations director), Hal Beaver, executive director of the Georgia Association of Elementary School Principals and Dr. Brian Hightower (CCSD superintendent). The presentation was made by Hal Beaver, Georgia Association of Elementary School Principals Executive Director, at Woodstock Elementary School where Wasserman serves as an assistant principal. The honor also includes a $500 award. Dr. Cindy Kiernan, dean of the Price School of Education at Reinhardt University, said Wasserman’s experiences at Reinhardt are reflected in the University’s mission of educating the whole person. Wasserman credits the educator that she has become to Reinhardt and its faculty members – a sentiment she highlighted while speaking at a recent retirement event. She chose to speak about RU alumnus, former Reinhardt adjunct professor and former Cherokee County School District superintendent, Gene Norton. Wasserman began with the CCSD as a classroom teacher in 2006 after graduating from Reinhardt. She continued her education and earned a master’s degree in early childhood education and specialist in educational leadership degree from Kennesaw State University. She was named the school’s Teacher of the Year for the 2013-14 school year. Fellow RU alumnus and current Cherokee County School District superintendent, Dr. Brian Hightower, said the respect for Wasserman and her work as an educator and administrator go far past the walls of Woodstock Elementary School.